The 10-ball break shot is more similar to 8-ball than 9-ball. 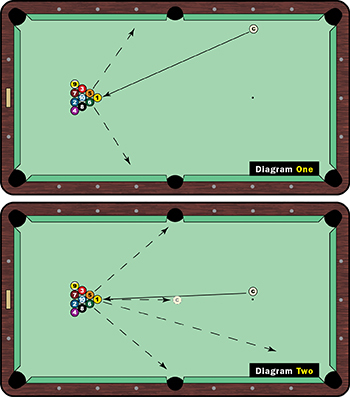 In the last issue I discussed the common mistakes players � particularly amateur players � make on the 9-ball break. In this issue, let�s look at the 10-ball break shot. Obviously, the biggest immediate difference in the 10-ball break is that adding one ball to the rack eliminates the wing ball, which is one of the key elements of the 9-ball break. The key balls on the 10-ball break are the balls directly behind the 1 ball in the rack. I see a lot of amateurs break from the rail in 10-ball, similar to their 9-ball break (Diagram One). The first danger with this approach is losing the cue ball to the left or right from not getting a solid hit on the 1 ball. If you are off even a little on the break, your chances of making one of those balls in the second row become really slim. The rail break in 10-ball also takes a lot of power and energy away from the rack because the majority of the balls are in the back two rows. Your only real chance for making a ball when breaking from the rail in 10-ball is the 1 ball in the side pocket. The 5 ball and 6 ball will hit the rail below the side pocket because of the energy lost by the thin hit on the 1 ball. Any ball you make after that is pure luck and the balls are more likely to settle in more clusters. The best option is to break from a more central position on the table, either dead center or a few inches right or left. Every table is different, and conditions will impact your choice, but most pros (myself included) break just left or right of center. As Diagram Two indicates, the contact point on the 1 should be as if you were hitting it straight on from the center of the table. Aim to hit the 1 square and cue just below center. Keep your eye on cue ball contact. If you hit this properly, you have a great chance to make the 5 ball or 6 ball in one of the side pockets. These are your target balls. The center break in 10-ball also offers a greater chance of pocketing additional balls on the break and offers better control of the cue ball and 1 ball, provided you hit the 1 square. Professional players know that if they hit the 1 ball square in 10-ball breaking from the center, the 1 ball will track towards the top left-hand pocket. In some ways, the 10-ball break is easier to control than the 9-ball break, especially if you are hitting them good and square on a consistent basis. I only use the side rail break if I am really struggling with the center break. So, take this information to the practice table and work on your break shots. Always remember: A balanced stance is key and don�t lunge into the break. Timing is essential. Let the body take over on the delivery, similar to a drive in golf. Don�t allow your body or arms to get ahead of your body. The moral: Master the break like the top pros and your game will benefit from the opportunities a good break creates.